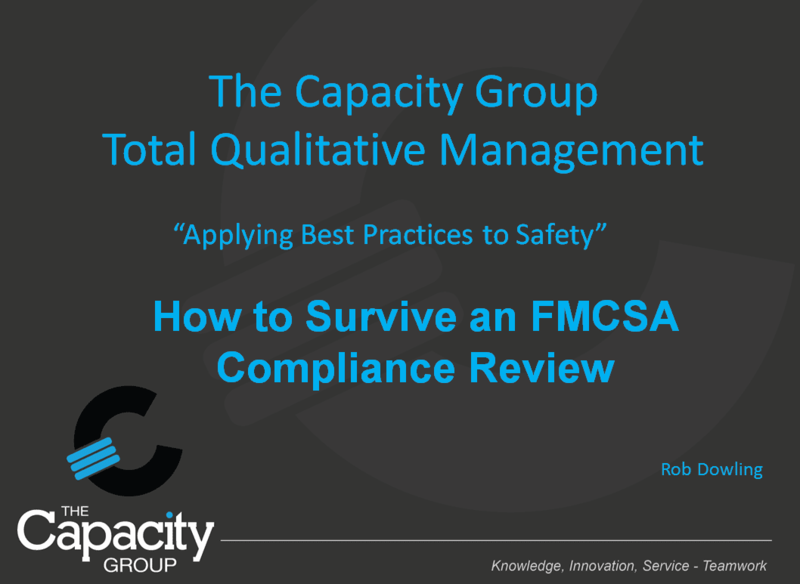 Expert speaker Rob Dowling, Transportation Safety & Loss Control Director at The Capacity Group, reviews the key components of the compliance review, the procedures you’ll need in order to achieve a satisfactory rating, and the consequences of failing to do so. Topics include: What is a Compliance Review, Compliance Review Process, When Do I Begin The Process, Six Factor Review Process, and a Continuous Process to Remain Compliant. Expert speaker Rob Dowling, Transportation Safety & Loss Control Director at The Capacity Group, reviews the key components of pre-trip and post-trip vehicle inspections, including pre-trip inspection requirements, post-trip inspection requirements, driver vehicle inspection reporting and responsibilities, recordkeeping, compliance, audits, and more. Interstate Motor Carriers invites you to a complimentary, educational web seminar on the FMCSA mandated responsibilities of motor carriers, drivers, and IEPs involved in intermodal transportation. 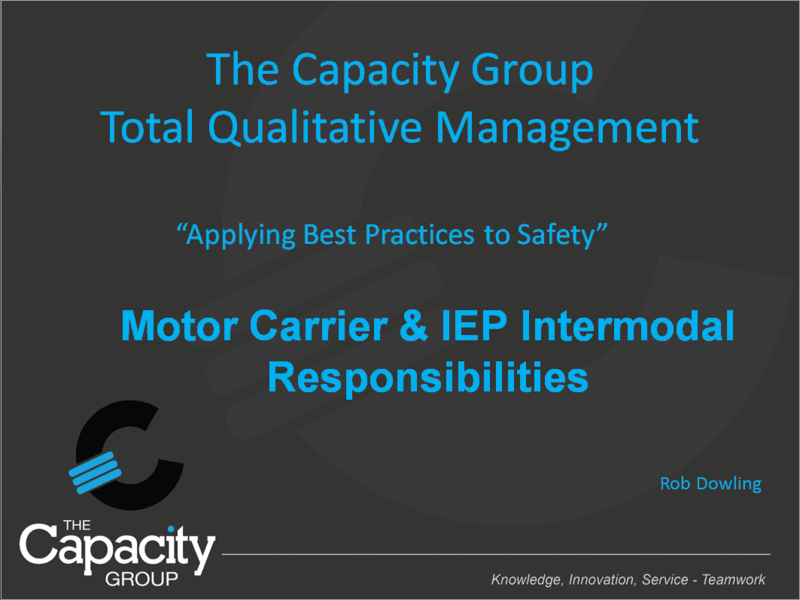 Rob Dowling, Transportation Safety & Loss Control Director at The Capacity Group, will provide an overview of intermodal transportation and related FMCSA regulations. All businesses involved in intermodal transportation should attend this webinar. Expert guest speaker, Attorney Doug Marcello, explains how to effectively monitor CSA scores and successfully challenge points through the DataQ system. CSA scores have a dramatic effect on transportation organizations, impacting revenue and profitability. Subject matter experts Attorney John P. Kellenberger and Craig Weindorf explain how CSA Scores impact the growth, costs and profitability of transportation businesses. Attorney Kellenberger reviews recent court decisions that have resulted in increased scrutiny of CSA Scores by shippers and brokers, changing the way carriers are selected. Mr. Weindorf discusses how CSA Scores and BASIC Alerts are affecting insurance premiums and impacting the bottom line for trucking companies. This web seminar discusses Legislative Efforts to Reclassify Owner Operators and Part Time Employees. This important issue impacts how your drivers are viewed by the IRS, and the obligations you may have to provide worker’s compensation and unemployment coverage. Subject matter expert Attorney John P. Kellenberger reviews current legislative efforts regarding reclassification and best practices for transportation companies to protect themselves. This webinar compares and contrasts independent contractors vs. employees classification. Subject matter experts Attorney John P. Kellenberger addresses topics such as: What is Reclassification? Understanding Reclassification from a State and Federal Perspective. What are the Risks of Reclassification? And Best Practices to Avoid Reclassification.